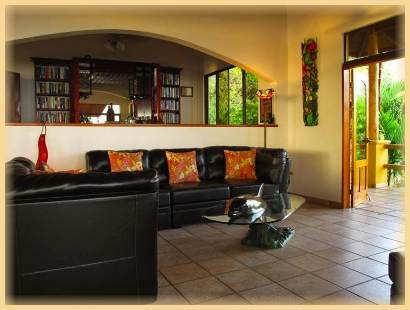 Costa Rica Exclusive Vacation Villa Rental Casi el Cielo | An exclusive villa with full-time staff, gourmet meals, breathtaking ocean view, and attention to every detail. Reserve an exclusive villa with full-time staff, gourmet meals, breathtaking ocean view, and attention to every detail. Casi el Cielo offers the best of many worlds combining a private villa rental with full-time staff. Our in-house chef will start your day with a large breakfast of fresh locally grown fruits as well as Costa Rican dishes and American favorites. Dinner each night is a stellar event, a culinary delight specially prepared for you and elegantly served on our expansive terrace overlooking the Pacific Ocean. Your personal chef will please every member of your group with a four course dinner featuring international dishes. Also included in the price of the villa is early morning coffee service to the terraces, daily maid service and laundry service. With this all-inclusive attention, you can spend your days exploring the captivating treasures of our unique area before returning to Casi el Cielo, your Costa Rican home. 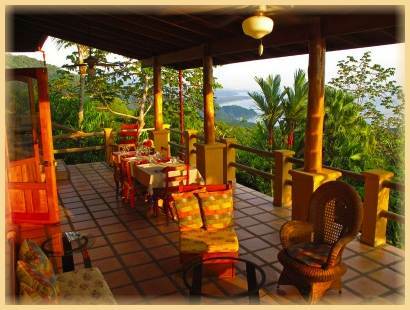 Casi el Cielo has been carefully designed to enhance your Costa Rican experience. The terrace overlooking the sparkling water of the Pacific Ocean and the verdant rainforest forms the perfect setting for gatherings, meals or quiet reflection. The spacious common area allows guests to take advantage of Wi-Fi service, satellite TV, the game area and the library. A garden filled with birds and butterflies surrounds the charming swimming pool with swim-up bar, waterfall and rancho. From your joyous awakening to the sound of birds and howler monkeys to your contented retiring after a day filled with adventure, the ambiance of Casi el Cielo embraces you. This vacation villa rental truly is Almost Heaven.